So, just who was Mr. David Castleman Tandy and what was his connection to our area? 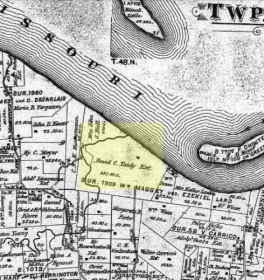 If you own land in the Murphysburg Historic Residential District, specifically in Section 3, or land in other Joplin Sections 7, 10, 11 or 14, you might have seen the name of David C. Tandy on your abstract as the “original” owner of the land. The abstract may also read, “Copy of Patent or Special Warranty Deed with dates of 1851, 1859, 1864, and “Consideration – Military Service”. Current landowners may assume that Mr. Tandy served in the military. Self-proclaimed amateur history detectives Mary Anne Phillips and Paula Callihan decided to find out what branch of service and which war Mr. Tandy served in. 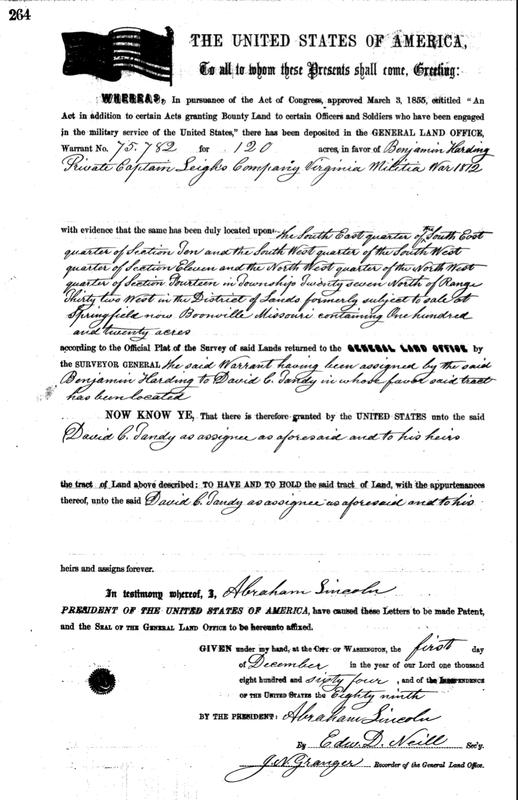 With the assistance of the Jasper County Records Department’s staff and volunteers, they discovered that the 1860 U.S. Census revealed David Tandy lived at 123 Olive in St. Louis and was married to Anna Cabell Castleman. Mr. Tandy never resided in Joplin. 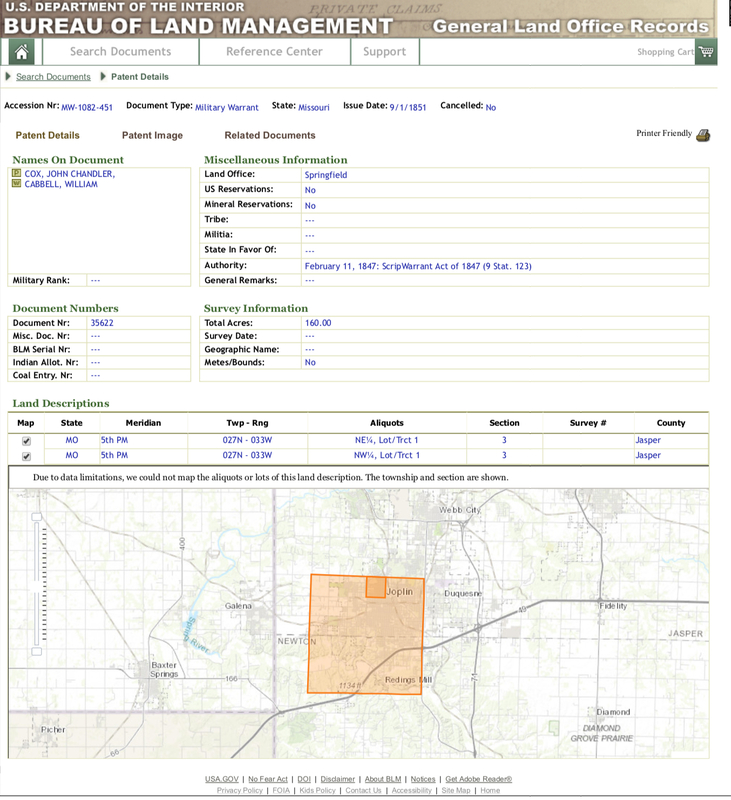 According to the Bureau of Land Management’s website, Mr. Tandy acquired land all over the state of Missouri, not just in Joplin. Continued research uncovered Mr. Tandy on the U.S. Civil War Draft Registration records from 1863-1865. The document revealed that he was a physician, that had been born in Kentucky and still lived on Olive Street in St. Louis. In the “remark” column, it revealed that Donald Cameron was hired as Tandy’s military “substitute” on November 16, 1864. Cameron’s Civil War service was in the Eighteenth Regiment of the Missouri Infantry and was listed as a Private. 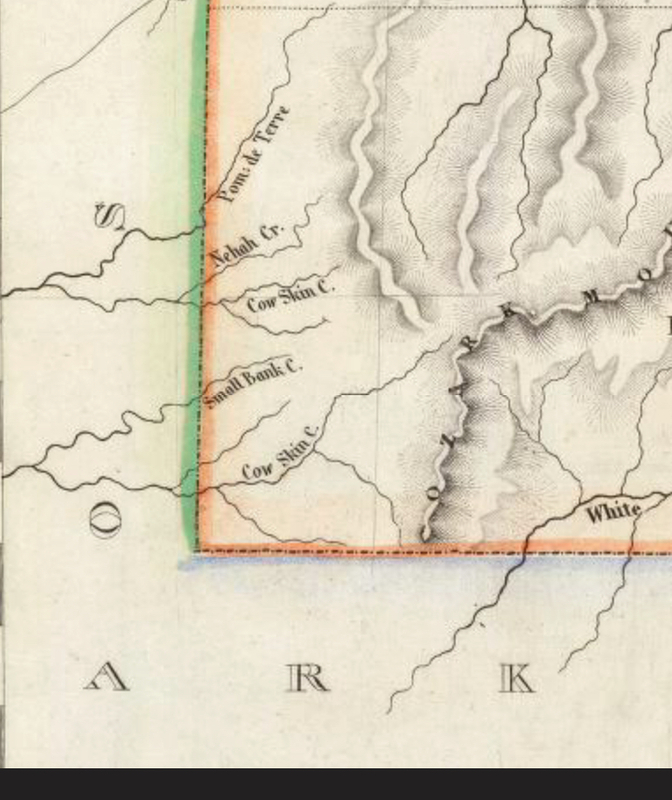 So, the question still remains—how did Tandy acquire land in Joplin? 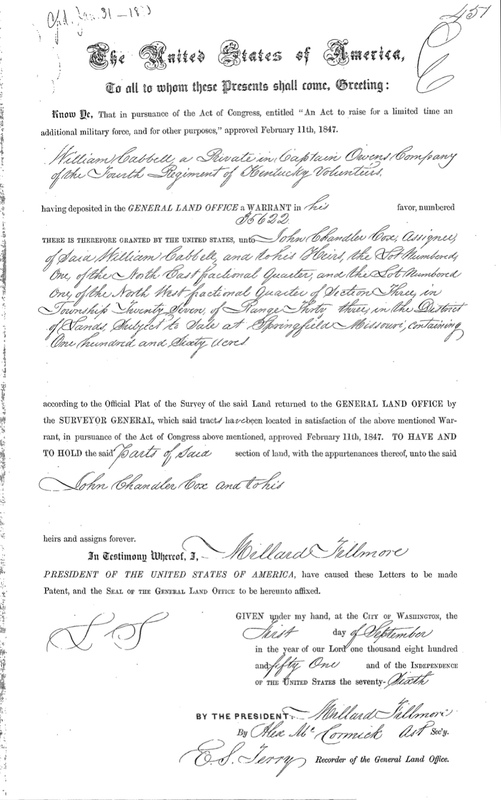 The answer lies in the Bounty-Land Warrants for Military Service, 1775-1855 Congressional Acts. Starting in 1775, the United States granted bounty-land warrants for military service, including volunteer militias primarily to encourage volunteer enlistments. They also rewarded veterans for service during the Revolutionary War, The War of 1812, the Mexican War, a variety of Indian wars, Indian removals and other military actions during the 1850’s. 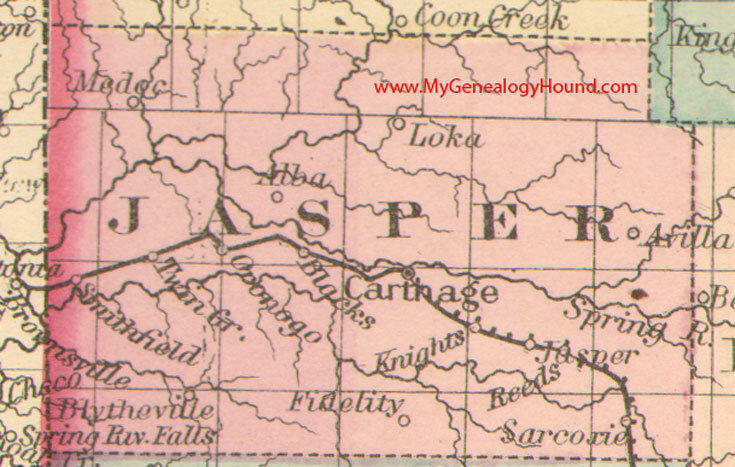 During that time the area was sparsly populated, the early Joplin pioneers, John Chandler Cox, Solomon Rothenberger, Reverend Harris Joplin and William Tingle civilized the area by forming a town. Many veterans who received bounty-land did not take possession but sold them to another party. 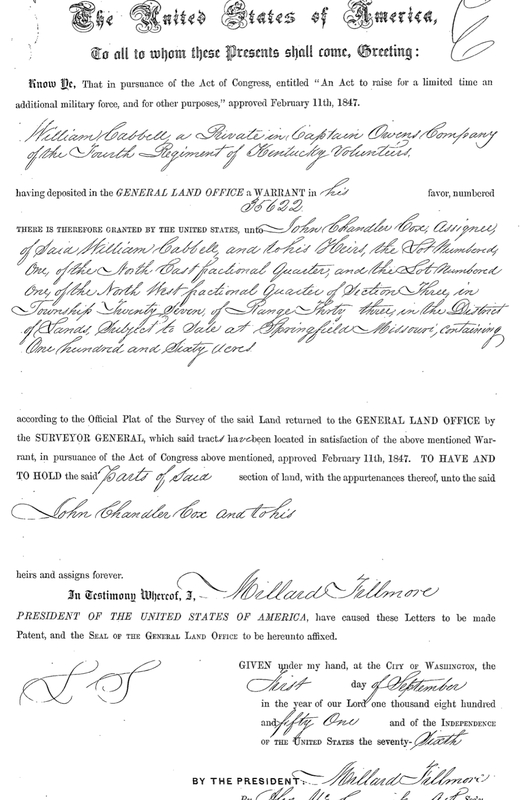 The land that was granted was “public land” and the authority was granted through the “Scrip Warrant Act of 1855″. U.S. land acquisition from Native Americans, Louisiana Purchase, etc. is a conversation for another day. According to Joplin Title Company, the information on the actual signed Warrant has all of the necessary information going back to the land grant via the General Land Office in Springfield, Missouri. The abstract has “abbreviated” information and in this case, only shows Mr. Tandy. Yeats later, tracts of land were laid out in town lots and sold to such notable people as Oliver H. Pitcher, Oliver S. Pitcher (early spelling for Picher), Mrs. Adelia Moffet, William Sergeant and W. P Davis, Patrick Murphy’s business partner.